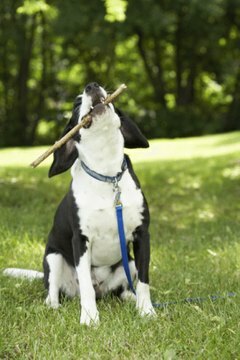 Many people try to teach their dogs tricks such as sitting down or shaking hands, but you might feel your dog is extra special and able to do something a little more complicated. A backflip is sure to impress, but it's not the easiest trick to teach your dog. However, with a little patience and a lot of work, you can teach your dog how to perform a backflip. Hold a doggie treat in front of you, high up over the dog, putting one of your legs slightly forward. The point of this is to have your dog learn to use your leg as a launching point. Pat your chest and then utter your command, whatever you want it to be. Your dog will try to jump straight for the treat. Reward the dog with the treat when it tries to use your leg to launch up and grab the treat. Stretch the treat farther out from your body and repeat the command to encourage the dog to arch backward to get the treat. Keep practicing this with the dog until it does it consistently. Keep stretching further out until the dog is forced to do a complete backflip to get the treat.